Soap Thai Madame Heng pomegranate in bright packaging can serve as a great gift not only for friends and relatives, but also for yourself! Contains extract of pomegranate, chamomile and ascorbic acid (vitamin C). Soap suitable for all skin types, deeply cleanses the skin. Due to the content of various antioxidants can prevent skin damage caused by free radicals. Contributes to the protection of collagen fibres from damage and tear, which is one of the main causes of skin aging and wrinkles. 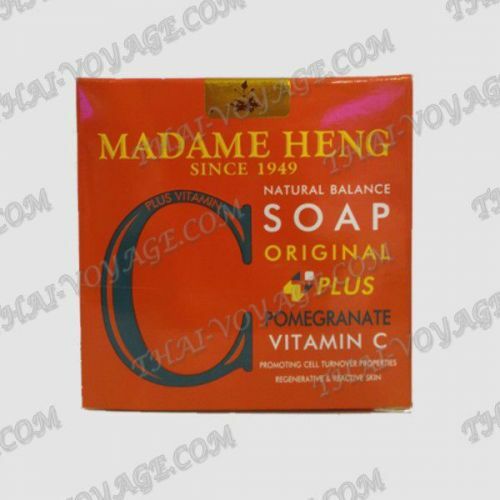 The special formula of this soap, developed by Madame Heng, in combination with vitamin C also allows you to achieve radiant purity and whiteness of the skin. Stains become less noticeable scarring from acne. Effective for lightening the underarms, inner thighs and other intimate areas. With regular use of soap, skin moist and white, will look younger. This wonderful soap can be used for daily washing of face and body.